Spend a relaxed day cruising or a wonderful afternoon sailing and in the evening watch the sun go down. Follow the coastline of Phuket from Chalong heading West passing many bays and beaches. Cruise to the nearby islands of Phi Phi Leay and Phi Phi Don or cruise the eastern coast into Phang Nga bay with its amazing limestone rock formations. 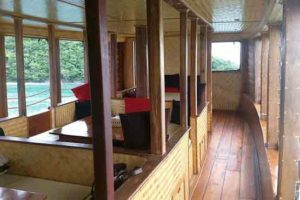 Are you a single traveler or a couple who would like to join a charter but may not be able to pay for a whole one on your own? At Epic Charters, we have a number of "open charters" that you can choose to enjoy all the benefits of a charter experience - at a price that's affordable. Choose from a variety of open charters on either sailboats, motorboats, or speedboats, and enjoy single or multi-day charters with sightseeing, fishing, diving and just cruising around some great locations with new friends from around the world. 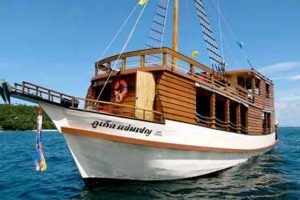 Join one today and you'll see that its the best way to see the islands and beaches of Phuket. Each join In Charter is designed to suit the needs of individual travelers and couples who want the luxury and service of a chartered boat to the islands and beaches of Phuket, Thailand, but who may need to join with others in order to share the costs of the experience. In addition to the thrill of the ride and the experience of the trip itself, open charters offer you the opportunity to meet other like-minded travelers from around the world - enhancing your vacation experience with new people. You can choose from a wide range of scheduled open charters with any of our great boats, each with their own fantastic trips that may include sight-seeing, snorkeling, swimming, fishing, diving or other water sports activities. You may enjoy such great islands and beaches such as Coral Island, Phang Nga Bay, Krabi, Phi Phi, Racha Yai, Racha Noi, Nai Harn beach and other destinations throughout Phuket, Thailand. Whether you would like to join up with an Open Charter on a motorboat, speedboat, or sailboat, whether you'd like to go for a day trip or multi-day journey, experience SCUBA Diving or Game Fishing, snorkeling or sightseeing; Epic Charters has the Join In Charter experience that is right for you, with great boats, great yachts, great people and great adventures for you to enjoy on the islands and beaches of Phuket, Thailand. Check out our available Open Charters - and if you don't see what you'd like to do, call us and we'll try to arrange something that suits your needs. Get in touch - Sailing and Motor boating with Epic Charters is an experience you won't forget.